In 1985, "We Are the World" was rocking the airwaves, Cabbage Patch Kids were a thing and the Goonies were on the hunt for treasure. It was also when Wrestlemania debuted and changed pay-per-view. 1985 Topps Baseball brought one of the decade's more memorable designs and popular rookie cards with Mark McGwire. 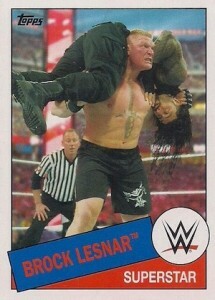 2015 Topps WWE Heritage heads back 30 years, borrowing heavily from the baseball set's designs and subset themes. Hobby boxes come with a pair of hits that draw from autographs, memorabilia cards and printing plates. The base set has 110 cards. It's a mix of current wrestlers, Divas, NXT prospects and retired stars. Parallels come in several forms. Black are the most common, landing 1:6 hobby packs. Others include hobby-exclusive Silver (1:24), Gold (#/10), Printing Plates and Red (1/1). Hobby packs come with at least three inserts, one each of NXT Called Up, Rookie of the Year and Then and Now. Each has 30 cards. NXT Called Up showcases stars that have made the transition from the developmental roster to the main one. Rookie of the Year looks back at the top debuts for each year over the last three decades. Then and Now pictures current Superstars and Divas as they look in 2015 as well as when they made their WWE debut, even if it was only a couple of years ago. Hulk Hogan Tribute (1:6) wraps up with the final ten cards of the cross-brand set that has run throughout the year. Gold parallels are numbered to 10 while Red versions are limited to one copy each. Autographs come with on-card signatures, an upgrade from the last WWE Heritage release in 2012. Signers include Superstars, Divas, NXT stars and retired Legends. 2015 Topps WWE Heritage has three types of relic cards, all of which come with event-used memorabilia. Swatch Relics come with pieces of gear worn by the featured stars. Seth Rollins, Kevin Owens, John Cena, Bray Wyatt and Finn Balor are among those with shirt relics. There's also a bandana relic from Luke Harper. Money in the Bank 2015 Mat Relics come with a piece of the canvas from the pay-per-view. There are also Turnbuckle Pad Relics. Autograph and relic cards have a few parallels to go with the basic versions: Black (#/50), Gold (#/10) and Red (1/1). Silver Autographs, which are limited to 25 copies each, can also be found in hobby packs. 110 cards. Shop for base sets on eBay. 30 cards. 1 per pack. This is a great set with some great cards. However, I have noticed since Hulk Hogan has been left out of the base set (due to his falling out with WWE over racial remarks), I believe there isn’t gonna be anymore of the Hulk Hogan Tribute cards and instead have been replaced by the nWo subset (which also doesn’t feature Hogan in his Hollywood Hogan persona). I could be wrong but I think it’s safe to say the Hogan Tribute set won’t be properly finished anytime soon. I bought two hobby boxes recently. I can’t complain that I got a Daniel Bryan and John Cena autograph. But, In the second box I ended up only getting one unique NXT called up card and 2 different 2k16 cards. Rookie of the year, Then and Now, and NWO tribute were all doubles from the first box. A little disappointed feeling like it’s a waste of money to buy another box if my chances of getting the cards I need is low. 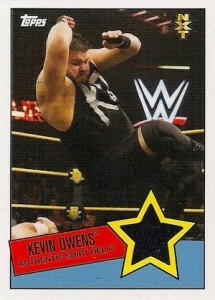 Also I’ve read there are only ten NWO tribute cards the back of the cards say there are 40. And you only get four per box. I’ve seen the NWO card set listed at 10 dollars. This just can’t be. You would have to buy ten boxes and hope you get a different NWO card in every box. You would spend 360 dollars. And I’m thinking you would need to buy more than ten just to get that set. I feel there is a lot of misinformation about this set out there and wouldn’t waste my money on it. 2015 Topps WWE Heritage 30th Anniversary Trading Cards HOBBY Box 2 HITS PER BOX! 2015 TOPPS WWE HERITAGE HOBBY BOX SEALED NEW 2 HITS PER BOX AUTOGRAPH RELICS ? ?